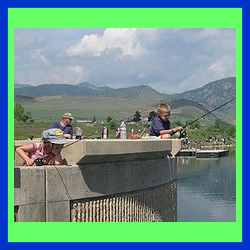 The annual Arvada Colorado Kids Fishing Contest takes place at the Arvada Reservoir off of 64th and Highway 93 in Arvada Colorado in June. This is a FREE kids fishing event – the tourney starts at 6am sharp and you must have your largest fish measured and weighed by 11:45am. Awards will be presented to various age groups at 12PM. Tackle is provided for those who do not have any – boats are not allowed during this event. Tags: Arvada CO Kids Fishing, Arvada Colorado Fishing, Arvada Kids Fishing Contest, Arvada Reservoir, Arvada Reservoir Contest, Arvada Reservoir Kids, Arvada Reservoir Regulations, Fishing in Arvada Colorado, Go Fishing in Arvada, Kids Fishing Arvada, Kids Fishing Contest, Kids Fishing Contest Arvada CO, Kids Fishing in Arvada, Kids Fishing Tournament, Kids Fishing Tournament Colorado, Kids Fishing Tourney, Where to fish in Arvada CO?